My awesome, loving husband saved me tonight and took both of the kids to Boyscouts! I am sitting here at my computer in peace! There are no yelling and fighting children! Although, I don't know what this deafening sound is in my ears.....Oh, that's right, it's called silence. I've heard it can be quite deafening and now I know what that means! For dinner tonight, I decided to try something different. I was inspired by my dear friend Radhika. She has been on a whirlwind cooking spree and I decided I had better try one of the many recipes she has been cooking up for her family lately. She got this recipe from her foodie blogger friend over at What's Cooking? I, like Radhika, changed it up just a little. When I try a new recipe, I usually like to follow it to a "T". However, I didn't have beef on hand so I used chicken. Check out Radhika's version! When my family and I tried it, we discussed the dish. We really liked the crispy chicken and we decided it would be really good to use shrimp in place of the beef or chicken as well. My husband came up with a veggie version. His suggestion was to coat broccoli, squash and/or zucchini in the cornstarch and fry it up. All in all, we decided that anything in that glorious sauce would be yummy! As Radhika said, "The sauce is the boss!" Enjoy! You can find the recipe here! After you have tried it and if you liked it, pass it on! Heat the oil in an electric skillet to 375 degrees. Mix the cornstarch, salt and pepper in a shallow dish, and coat the strips of flank steaks with the mixture. Deep fry the chicken just until golden brown. When done, remove them from the oil and drain. Place the soy sauce, rice wine vinegar and honey in a bowl and mix well. Add sugar, chili paste, water, and ginger, and mix again. 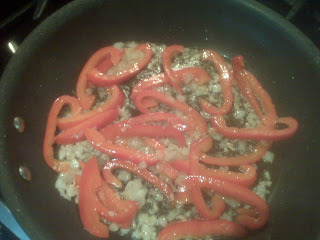 Heat 2 Tablespoons oil in a wok, and saute the onions, garlic and red pepper until crisp-tender, or to your liking. Add the soy sauce mixture and heat until warm. 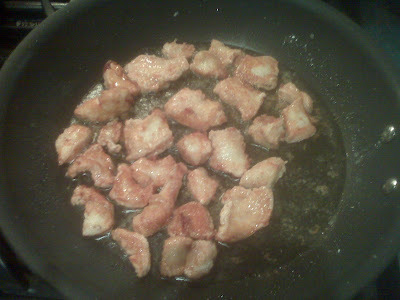 Last, add the fried strips of chicken and toss well to coat thoroughly in sauce. 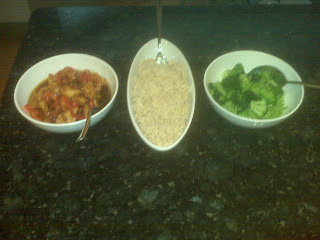 Serve with noodles or steamed rice. LOLZ. I am blushing now.